Choose from a unique range of personalised wedding invites designed to suit your style, wedding theme, colour scheme and personality. 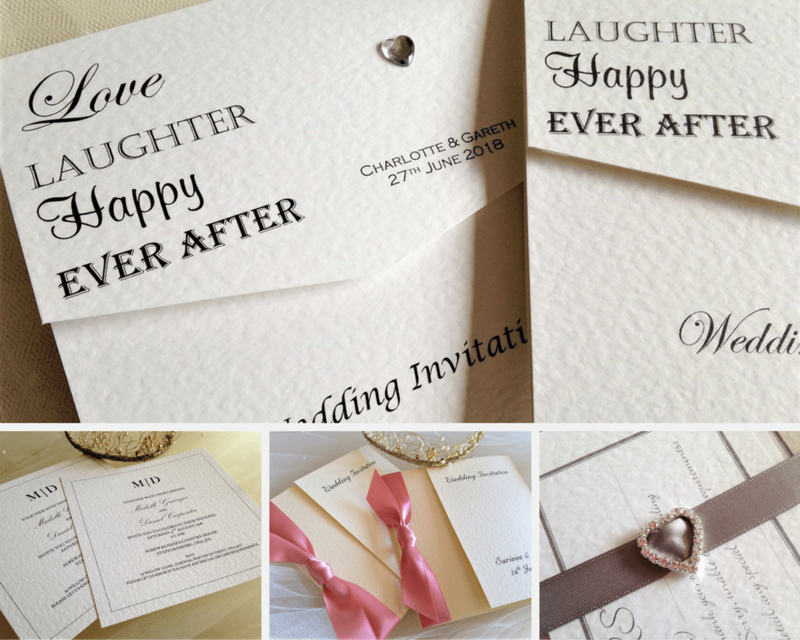 Whatever your style Daisy Chain Invites have an affordable wedding invitation option for you. All our wedding invitations are supplied with free envelopes and free guest name printing as standard. 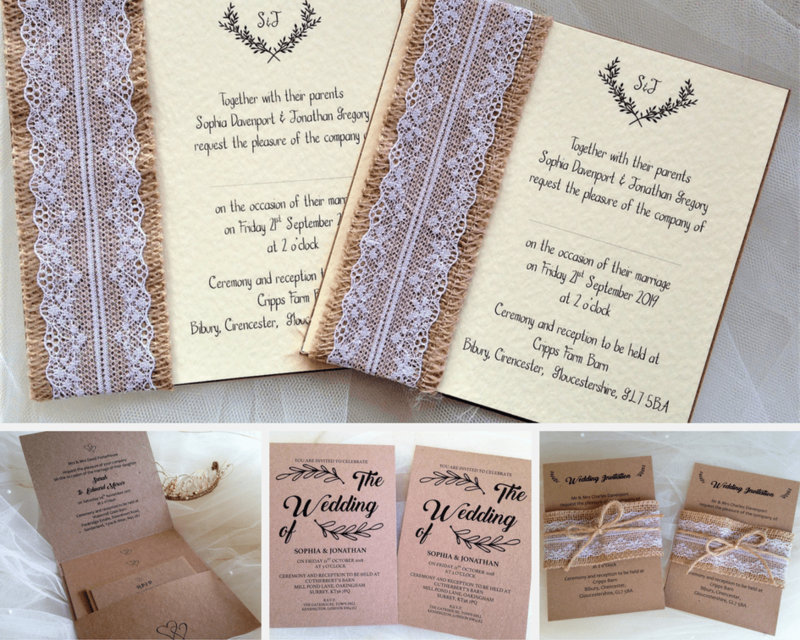 We offer amazing value for money, professionally printed wedding invites on thick card stock. We have an invitation card for every budget. Our cheapest wedding invitations are all less than £1 each. Browse our range of invites below, any questions just drop us an email or give us a call. We are available 7 days a week until 9pm. Check out our reviews and order with confidence. Choose from a unique range of personalised wedding invitations designed to suit your wedding theme, colour scheme and personality. Whatever your style Daisy Chain Invites have an invitation card for you. We have been supplying beautiful wedding stationery for over 10 years and we continue to source and design new invitation styles as fashion and trends change. An important part of our business is to continually introduce new colours and new products in both invitations and matching stationery. It’s always good to know what the latest wedding theme trends are and exciting to see new designs come onto market. 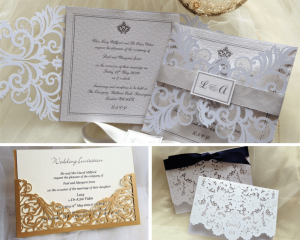 Daisy Chain Invites have a huge of range of wedding invitations to choose from. 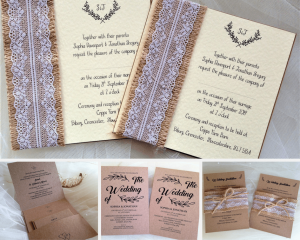 Take a look at our contemporary wedding invites, rustic, vintage and everything in between. We stock invitations with ribbons, buckles, butterflies, diamantes and pockets. Laser cut wedding invitations are popular choices for 2018. The most important thing is to find the right wedding invitation design for you and your special day, browse our best sellers below for some inspiration. 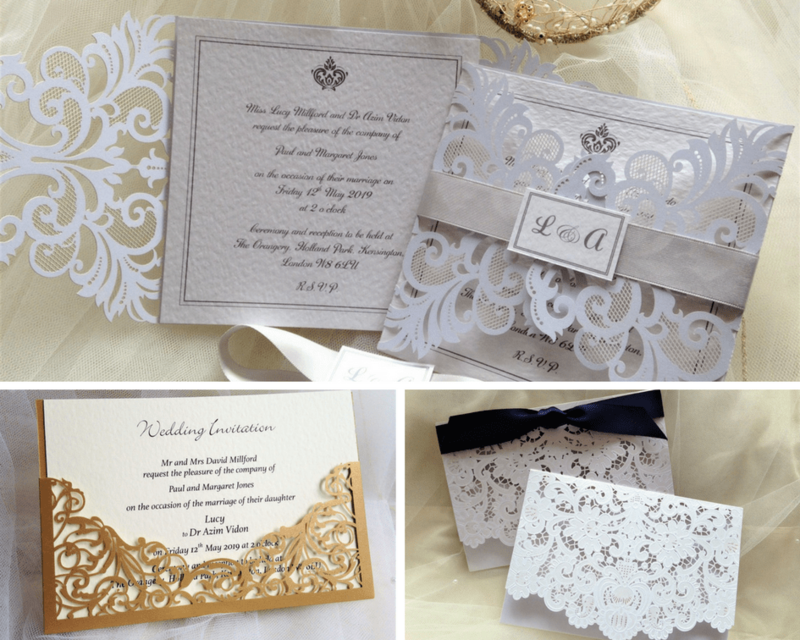 Our vast collection of wedding invites are all customisable to offer a truly personalised touch. We can also print your guests names directly onto the invitations free of charge. Simply select your design, enter your wedding details in the comments box, select your font style, ribbon colour and add them to your shopping cart. If you are including a guest list you can either copy and paste it into the comments box or simply email it to us at info@daisychaininvites.co.uk. We prefer an unnumbered guest list. We will acknowledge your order and send you a little note to confirm its been safely received. An invoice is then sent to you for payment. Following payment Jan will then produce proofs of all the items ordered and they will be emailed to you for approval or amendment before printing. If you are still unsure of the process a further explanation can be found on our How to Order Page. 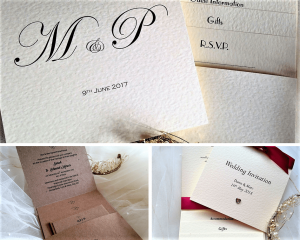 Browse our collection of personalised wedding invites, read our testimonials and order with confidence. We won’t let you down! Daisy Chain Invites are a highly rated UK company. All items are professionally printed in the UK using the latest printing technology. We strive to be a valued part of your wedding day ensuring that your invites and stationery are created with care and attention to detail. We’re just an email or phone call away in our UK based office if you ever need to speak to us or have any questions. We are approachable and friendly and available until 9pm 7 days a week. Don’t forget to order evening invites for your reception! It’s not often you get married, so why not push the boat out with a luxurious finish to your wedding invitations? For something that really stands out from the crowd, why not try the laser cut finishes. Or perhaps something with a little more sass with our ‘Rhinestone Buckle Wedding Invitations’ adorned with a classy ribbon and sparkling buckle. And for those looking for a more traditional twist, our Pocket Fold Invites will wow your guests starting from £2.35, pick your favourite from the beautifully crafted range of wedding invites. Sometimes you just need to see and feel something in the flesh, we totally get it. Your wedding is the most important day of your life and most brides want to see every detail of their dream wedding ahead of the big event. Any of our wedding invites can be requested as samples for the cost of one invitation plus postage. Simply email us with details of the designs you’d like to get a closer look at and include your delivery address. All invitations come with free envelopes and free guest name printing too. There are various styles visualised on the website and will do our best to accommodate individual requirements, we can make personalised invites for any type of wedding ceremony. We are also able to produce wedding invites in a number of languages and have produced invites for Muslim, Polish, Romanian, Bulgarian, Spanish, French, Greek and Ghanaian weddings. Invitations are supplied fully assembled, no self assembly necessary. Because Daisy Chain Invites are based in the UK we can design and print invitations within a short timescale for quick delivery!